This is not some quickly skimmed comic that leaves you with a sense of wonder. Liu and Takeda create a world or magic, genocide, slavery, war and violence that can be uncomfortable and mesmerizing all at once. It’s not a fast read before you head off to work or a meeting. Sana Takeda is no stranger to house styles traditionally found in the comic medium. Back when Carol Danvers was still Ms. Marvel, Takeda molded her art to fit more in line with a big two publisher. Thankfully, that is no where to be seen in these panels filled with ornately detailed rooms, urban sprawl and dank dungeons. It’s a combination of manga and anime art tropes that feel instantly familiar, yet distinct and awe-inspiring. Character design reveals a class society built on race in this territory run by witches. Panel layouts and gutters are static and straight forward through most of the book. That helps to make the slanted or skewed panels, used as transitions just before and after scene changes, more dynamic. Even the color choice of the gutter adds to the story telling: white gutters indicating the present, white black gutters indicate flashback sequences. Liu & Takeda’s world combines elements of old and new world cities. Magic infused creatures are subjugated, enslaves and sometimes physically consumed to boister the dominant group of witches featured. They are referenced as the Cumaea, and hold an unspoken level of power over the city of Zamora. The enslaved Maika provides the readers with the point of view of looking up. At first, she appears as oppressed as all the other “monsters.” However, as the story quickly unfolds it is clear Maika has been manipulating the world around her for her own plans. The dialogue is purposefully vague. It’s clear Liu is trying to create a sense of mystery about the events of The Battle of Constantine as well as the roll of the Cumaea. However, that means the reveal in subsequent issues needs to be worth the current level mystery. For now it is partially revealed storytelling. If it’s just being used as a plot device the other techniques could have served the reader better. Only subsequent issues will show readers of this is an epic scale story or one that crawls through smaller stories. Some might see this book as slowly unfolding. That feeling can be attributed more to the 66 pages, triple the size of a regular comic. When you breakdown the actual pace, there is plenty happening. Their is political intrigue overtones but no direct addressing of the problems. Clearly some major elements are covering up what happened during a battle but just what is left to mystery. The weight of the subject matter, the violent imagery of how those captured are used and haged can be hard to read. This might slow the reader down and cause feeling of the pace to change. Liu addresses these elements in a follow up essay to explain the familial legacy that drove her to tell this story. 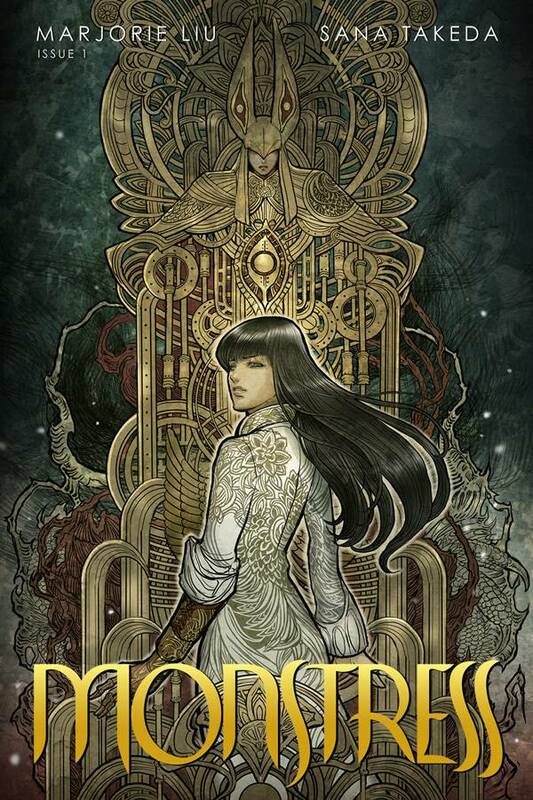 Monstress is a haunting look at war, that leaves the reader convicted about what they would be willing to do, in the name of survival.